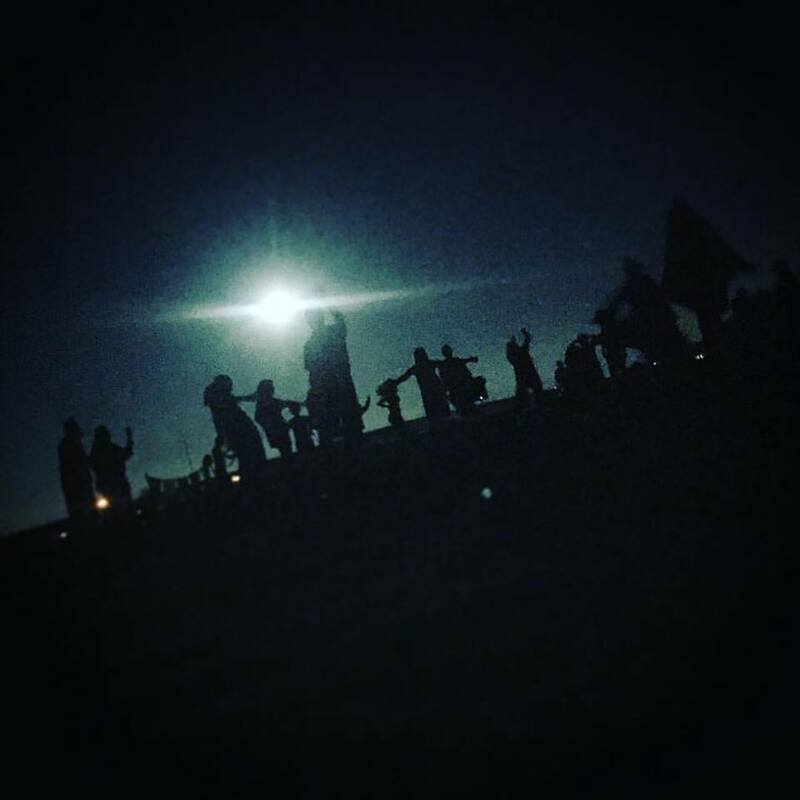 Last night I gathered for my monthly full moon dance. Normally this dance happens in a small temple and only women gather together to move in our uniqueness, with intention, silently to rhythmic music as we connect with the current moon. This month for the celebration of the harvest moon we invited our brothers and we danced outside on the salt flats by the Great Salt Lake. When I first saw this invitation I instantly knew in my gut I was going. I told/asked my husband and he said yes and actually asked if he could come. I said no women only, confused that men were also invited this month. Once I realized men were invited I invited him and we lined up my dad to baby sit our two children. Tyler and I arrived at the beach early. Watched the sun set, talked and played around with some yoga poses. When the sun set and the moon rose we gathered with our group and howled at the moon which appeared red. The love and excitement we all felt for the moon was palpable. I thought of all the women in all the times in all the lands who have looked to the moon and sought guidance. I felt grounded in my blood, in my bones, with my feet in the sand. My bare feet stood on cold dry salt sand. It cracked as I moved on it and we gathered into our circle. Our guides welcomed us, talked about the moon briefly, and the "rules" for our movement and then let us dance. Music played over generators as we danced, jumped, hopped, swayed, rolled, skipped, spun, pulsated, smiled, cried, yelled, laughed, crawled, ran, sat... It was beautiful to witness the black silhouettes of these human beings connecting with themselves, moving and breathing in their authenticity and how lucky I was to share that experience with them. We moved at different speeds within our circle outlined in the sand. As we repetitively touched the earth the sand that started our dry became wet and muddy. It was such a magnificent experience to feel the change under my feet. I felt grounded and connected to my Mother... Earth. The full moon represents abundance and she is about to move into waning, into releasing. As I gazed up at the moon with my hands over my heart I thought about what I want to release. I want to release my self judgment, and my self criticism so that I can stand in my power with self love and self confidence! With this intention I walk through the threshold leaving my old ways, thoughts and habits behind me. I move forward in a new way as a strong women who loves and cares for herself. A women who knows she can accomplish so much if she directs her energy into other things instead of the size of her love handles. How many hours, days, years I have wasted of my life caring about my size? and what you think of it? I have been working on this for 10 years but recently I have felt a lot of manifestation of forward momentum. Of letting go of that past identity so I can stand in my power fully. to share my life with this being! We get so caught up in life with children, bills, work, plans that I can forget this human experience and take it to seriously that I miss connecting with him as a Being. Dancing with him last night sometimes together but often apart was so amazing. Being able to do our own thing, feed our soul, be authentic, come together and connect, kiss, smile and then spin off again was a gift from Grace and one I will never forget. As we left we talked about our intentions. I shared with him about my self love and being ready to move past this threshold. He told me about his (I won't share it). He kept saying how much he enjoyed the dance and needed it. He also acknowledged how important these dances are for me and how much he supports me making time for them and will continue to encourage me to go to them in the future. This mad me so happy because I haven't been to a moon dance in a few months because I always assume he would rather me stay home and help with the kids. So hearing him say. "Yes! Do this!I will help you make this happen" made me heart soar. We talks again this morning about the transformative experience we had under the moon. Both so grateful that we can share these experiences. Tyler grew up Mormon and pointed out that there are many people who would be to uncomfortable with free movement under the moon and others would assume we were all on drugs and wouldn't want to participate. I am so grateful I can have these experiences. I am BLISSED out and am already counting down the days until I can dance with the moon again.